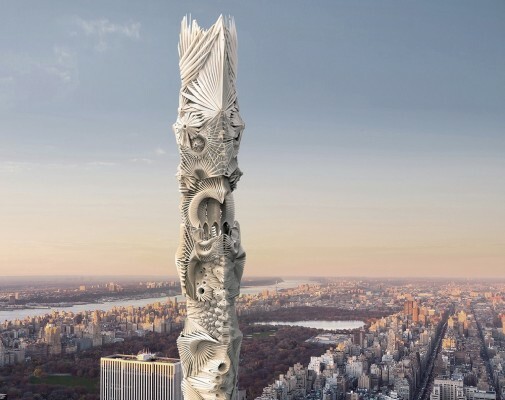 eVolo Magazine announce the winners of the 2016 Skyscraper Competition. The Jury selected 3 winners and 21 honorable mentions from 489 projects received. The annual award established in 2006 recognizes visionary ideas for building high- projects that through the novel novel use of technology, materials, programs, aesthetics, and spatial organizations, challenge the way we understand vertical architecture and its relationship with the natural and built environments. eVolo Magazine also announce the publication of EVOLO SKYSCRAPERS 3, the third book in the Skyscraper Series. This publication includes the best 150 projects received in the 2014, 2015, and 2016 competitions. This is a limited edition book and only 500 copies will be available worldwide. As the busiest and most densely populated county in America, Manhattan has always been a big fan of skyscrapers. Limited by its street grid, however, space in New York City is often skinny and tall. One exception being Central Park, a 1.3 square mile urban park, giving New Yorkers a change to escape the busy urban life. However, only a fraction of them can enjoy Central Park’s natural environment on a daily basis, and most of the population either live or work beyond the walking distance from it. 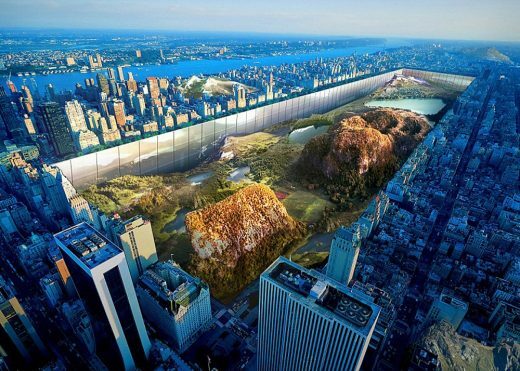 Is there a way to make Central Park available to more people? Our proposal is a hybrid multi-functional mega structure. Not by building up, but by digging down, it reveals the bedrock (mountain) that was hidden under Central Park, and creates space along the new cliff. 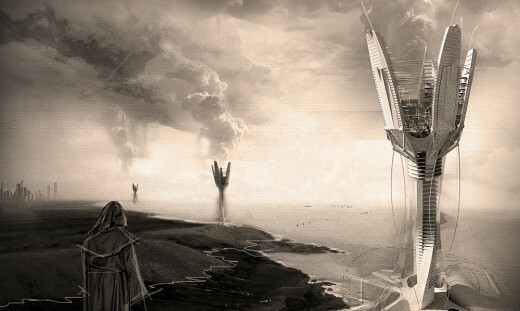 The ambition is to reverse the traditional relationship between landscape and architecture, in a way that every occupiable space has direct connection to the nature. The transparency of the tower changes constantly, while the tenants of the building-the drones fly in and out. The flickering lights of the battery station behind each module help with navigation and also indicate the occupancy percentage of the building as well. 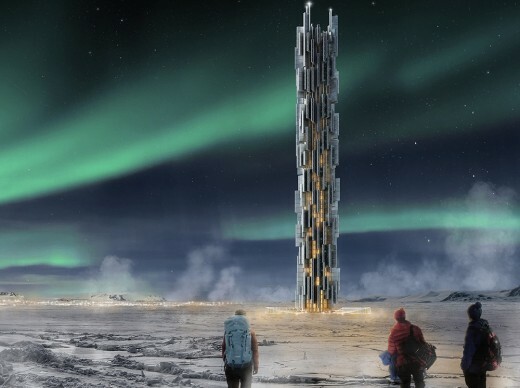 eVolo Magazine is pleased to invite architects, students, engineers, designers, and artists from around the globe to take part in the eVolo 2014 Skyscraper Competition. Established in 2006, the annual Skyscraper Competition is one of the world’s most prestigious awards for high-rise architecture. It recognizes outstanding ideas that redefine skyscraper design through the implementation of novel technologies, materials, programs, aesthetics, and spatial organizations along with studies on globalization, flexibility, adaptability, and the digital revolution. It is a forum that examines the relationship between the skyscraper and the natural world, the skyscraper and the community, and the skyscraper and the city. 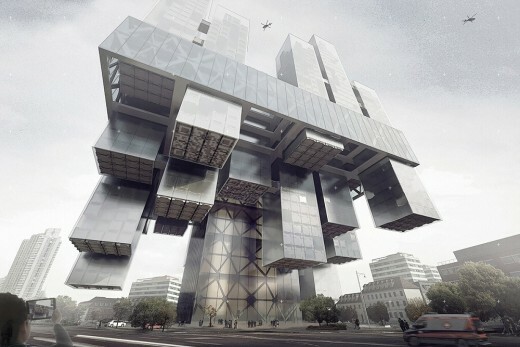 Winners of the eVolo 2013 Skyscraper Competition: 3 winners and 24 honorable mentions. Vetiver is a tropical plant with unique characteristics. Since the 80s, the Vetiver System (VS) has been tested for slope stabilization, pollution control and water quality improvement. Plants like Vetiver can absorb about 5,3 kg of CO2 per square meter during a year. If Vetiver has these miraculous features, why don’t use it in architecture? The 410 meters tall VetiVertical City aims to match the multi-functionality of a skyscraper with the new sustainable technology of VS.
eVolo Magazine is pleased to invite students, architects, engineers, designers, and artists from around the globe to take part in the eVolo 2013 Skyscraper Competition. Established in 2006, the annual Skyscraper Competition is one of the world’s most prestigious awards for high-rise architecture. 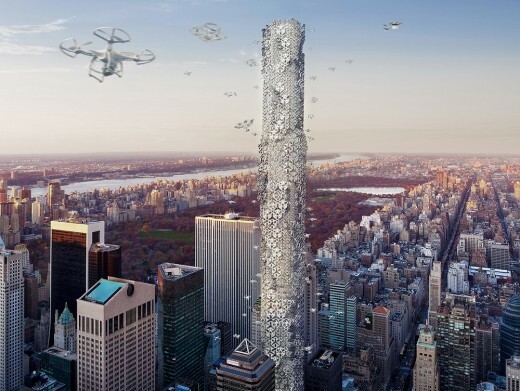 It recognizes outstanding ideas that redefine skyscraper design through the implementation of novel technologies, materials, programs, aesthetics, and spatial organizations along with studies on globalization, flexibility, adaptability, and the digital revolution. It is a forum that examines the relationship between the skyscraper and the natural world, the skyscraper and the community, and the skyscraper and the city. 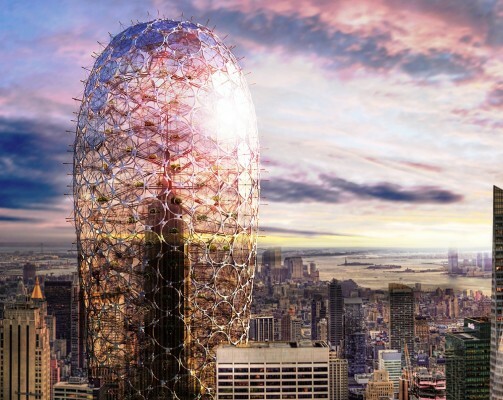 eVolo Magazine is pleased to announce the winners of the 2012 Skyscraper Competition. Established in 2006, the annual Skyscraper Competition recognizes outstanding ideas that redefine skyscraper design through the use of new technologies, materials, programs, aesthetics, and spatial organizations, along with studies on globalization, flexibility, adaptability, and the digital revolution. This is also an investigation on the public and private space and the role of the individual and the collective in the creation of a dynamic and adaptive vertical community. The award seeks to discover young talent, whose ideas will change the way we understand architecture and its relationship with the natural and built environments. The first place was awarded to Zhi Zheng, Hongchuan Zhao and Dongbai Song from China for their project “Himalaya Water Tower“. 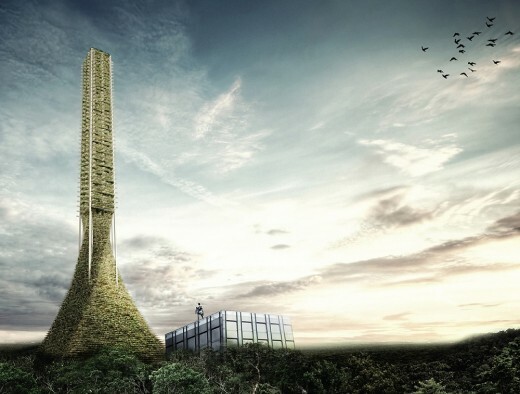 The proposal is a skyscraper located high in the Himalayan mountain range that stores water and helps regulate its dispersal to the land below as the mountains’ natural supplies dry up. 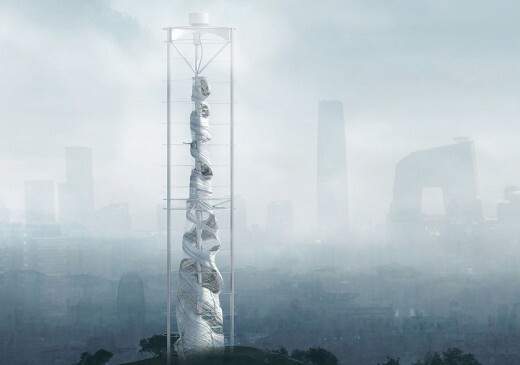 The skyscraper, which can be replicated en masse, will collect water in the rainy season, purify it, freeze it into ice and store it for future use. The second place was awarded to Yiting Shen, Nanjue Wang, Ji Xia, and Zihan Wang from China for their project “Mountain Band-Aid”, a design that seeks to simultaneously return the displaced Hmong mountain people to their homes and work as it restores the ecology of the Yunnan mountain range.